The hijacker, an Egyptian described as "unstable", had claimed to have explosives strapped to his waist but none were discovered after he gave himself up at Larnaca airport and was arrested. Most of the 55 passengers on the plane -- originally travelling from Alexandria to Cairo -- were quickly released after it had landed. But some escaped only minutes before the hijacker surrendered, including one uniformed man who was seen clambering out of a cockpit window and dropping to the ground. "From the beginning it was determined that this was not a case of terrorism," Foreign Minister Ioannis Kasoulides said, adding the man was "psychologically unstable". Egypt identified the man as 58-year-old Seif al-Din Mohamed Mostafa. Kasoulides said the man demanded to deliver a letter to his Cypriot ex-wife, with whom he was said to have children. She was brought to the airport and spoke to the man, the minister said, without elaborating. "There was no logical consistency for the demands to be taken seriously," Kasoulides said. Asked about the hijacker's demands to see his wife, Cyprus President Nicos Anastasiades laughed and said: "Always there is a woman." Searches by Cyprus police found no explosives on the hijacker of an EgyptAir plane diverted to the island or inside the aircraft, a police source told AFP. 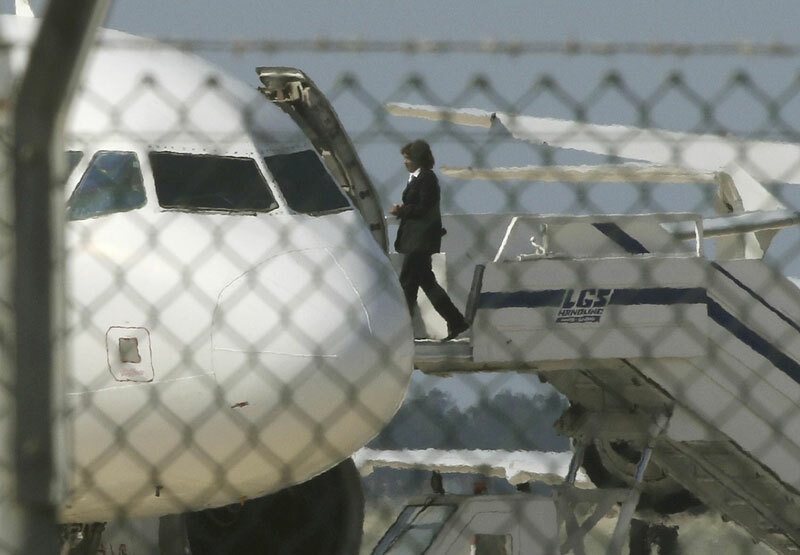 The hijacker, who is in custody after surrendering to police following a six-hour standoff at Larnaca airport, had claimed to be wearing an explosives belt, Egyptian officials said. Counter-terrorism police frisked the hijacker on the tarmac then interrogated him for more than an hour before boarding the plane and searching it with sniffer dogs. Egyptian Prime Minister Sherif Ismail said the man who hijacked an EgyptAir plane and diverted it to Cyprus was an Egyptian national who had asked to meet European Union officials or to fly on to another airport. Ismail told reporters that authorities would question the hijacker to ascertain his true motives, which remained a mystery. The suspected hijacker of an EgyptAir airliner surrendered to authorities at Larnaca airport in Cyprus on Tuesday, Cypriot authorities said. The hijacker emerged from the aircraft with his hands in the air, state TV said. "Its over," Cyprus's foreign ministry said in a tweet. Tuesday's hijacking of an EgyptAir airliner which was diverted to Cyprus does not appear to be terror-related, a senior official of Cyprus's foreign affairs ministry said. "What we have clarified ... is that it’s not about terrorism. It appears to be a person who is unstable, in an unstable psychological state and the issue is being handled accordingly," foreign ministry official Alexandros Zenon told journalists. UPDATE: At least four more people left a hijacked EgyptAir plane in Cyprus, one of them by climbing out of the cockpit window, an AFP correspondent reported. The other three were able to leave by the main door and walk down the steps. Armed police had taken up positions behind Larnaca airport's largely disused old terminal buildings as the four emerged. Egyptian officials had earlier said seven people remained on board. LATEST: An Egyptair official declared that 3 passengers, the pilot, co-pilot and 3 cabin crew members in addition to the hijacker are still onboard the aircraft. The Egyptian Minister of Civil Aviation has declared in a statement during the press conference held today at the ministry headquarter that an aircraft is heading from Cairo Airport at 12:30 CLT to Larnaca for the return of the passengers. This is according to the available information at this time. LATEST: Everyone on board a hijacked EgyptAir flight diverted to Cyrus on Tuesday has been released except for four crew members and three passengers, Egypt's civil aviation minister said. Sherif Fathy told a press conference that the captain, a co-pilot, an air hostess and a security man remained on board, along with the three passengers. He said there had been 55 passengers on board the plane, which was headed from Alexandria to Cairo, when the hijacker demanded it land in either Turkey or Cyprus. The aviation ministry had earlier said 81 people were on board. "He had no gun or anything. We don't know yet whether his (explosives) belt is real but for the safety of passengers we are dealing with it as real," he said. A plane will head to Larnaca at 1030 GMT to pick up the released passengers, he said. EARLIER REPORT: The hijacker of an EgyptAir flight, Ibrahim Abdel Tawwab Samaha, is a professor of veterinary medicine at Alexandria University, a staff list on the university website shows. Negotiations are currently underway between Cypriot authorities and a hijacker aboard the Egypt Air flight. Cyprus Foreign Ministry Official says, it is thought one hijacker onboard EgyptAir plane in Larnaca; Cannot confirm if strapped with explosives. Between 30 and 40 passengers released. Pilot of hijacked plane was threatened by a passenger with suicide belt, says Civil Aviation Ministry. The airline added the pilot was informed of the existence of a threat from a passenger who stated he has an explosive belt in his possession, forcing him to land the plane at Larnaca Airport, Cyprus. Cypriot authorities are currently dealing with the situation, EgyptAir further added. The hijacker asked police to back away from the aircraft, reported Reuters. Earlier, the airline tweeted: "Our flight MS181 is officially hijacked. we'll publish an official statement now." An Egyptair domestic flight from Alexandria to Cairo was hijacked on Tuesday and landed in Cyprus, state radio said. The Cyprus Broadcasting Corporation reported that 55 people were on board, with a crew of 7. There were earlier reports of about 80 to 81 people on board. At least one man was thought to be armed. 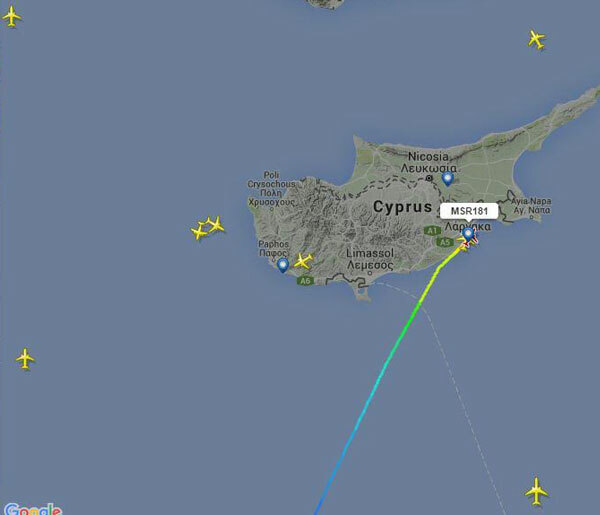 The hijacking occurred in Cyprus's flight information region and the airliner was diverted to Larnaca. Meanwhile, a Cypriot government official says the hijacked plane landed on Tuesday morning at the airport in Larnaca and that there are suspicions of a bomb on board. Both officials spoke on condition of anonymity under regulations.